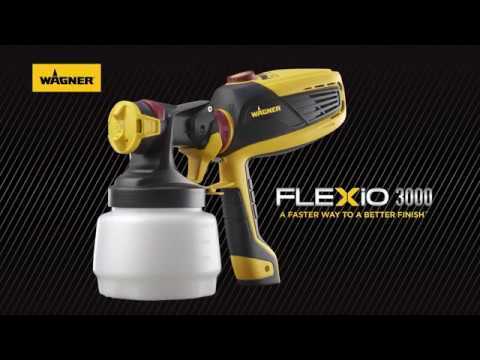 The Wagner FLEXiO 3000 hand-held sprayer, has variable speeds for cutting time and effort on home painting projects and can paint a wall 10 times faster than a brush. 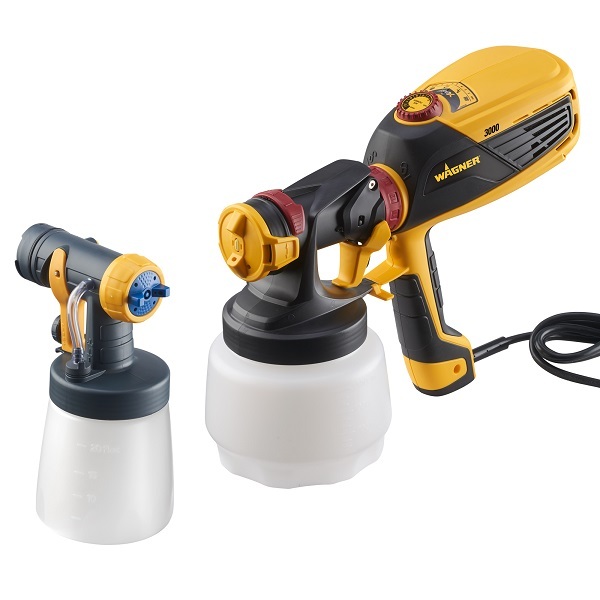 It comes with 2 different nozzles – one for painting walls, fences and siding. The other nozzle for fine finishing on cabinets and trim. The new nozzle design delivers an improved spray pattern and adjustable control with less mess and overspray. The FLEXiO 3000 has the flexibility to spray indoors and outdoor with the power to spray unthinned paint and stains with full coverage. Cleaning is faster than a brush or paint roller with just a few removable parts that separate and rinse clean. Flexio 3000 is rated 4.6 out of 5 by 153. Rated 5 out of 5 by Jonkon from Love the versatility! I am an avid DIY furniture builder and rehab furniture painter. The Flexio 3000 has the flexibility and versatility I want when spraying furniture. The detail finisher works great, with enough control to get a smooth finish.I love being able to alter the direction of the flow pattern, as I work my way around a piece. 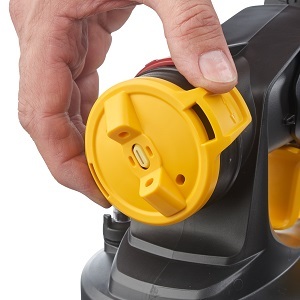 With the motor in the handle, rather than in a separate unit connected by a specific length hose, you are only limited to by the length of your extension cord! And clean up cant be any easier! I basically empty all of the paint out of the canister, rinse all of the parts off, fill the canister with water and continue to force water through the nozzle until clear. Rated 4 out of 5 by Justin87 from An evolutionary step I currently own the Flexio 590, so that will be my main point of comparison. First off, I'm disappointed that Wagner did not work to reduce the weight of the turbine unit. The Detail Finish Nozzle seems to be the same as what came with the 590. It would have been nice to see some better control of the spray width. The iSpray nozzle is certainly an evolutionary improvement. The spray width adjustment lever is larger and easier to actuate. The overall function of the material flow control dial is the same as on the 590's nozzle; they simply change how far one can pull the trigger. However, the dial on the new nozzle is a numbered ring with detents along the way, and and be adjusted faster. The numbers and detents should make it easier to get repeatable/consistent results. I've not yet had a chance to paint a large project like I have with the 590, I have tried a few sprays on some scrap. The results seem to be about to same. Clean up is slightly easier, with the new iSpray nozzle having two less parts to reassemble. Rated 3 out of 5 by Bschu5917 from Great for trim I am an owner of a Flexio 890 HVLP paint sprayer. I have used that system over 500 times and would probably be considered a power user. 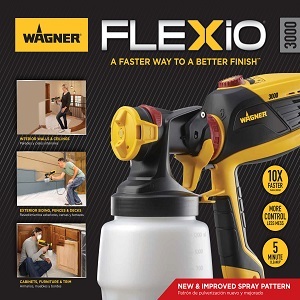 The folks at Wagner have asked me to evaluate their Flexio 3000 system. Since the 3000 system shares some significant similarities with the 890 I was definitely interested. Starting with general comments, the 3000 consists of a power unit, a detail sprayer for small jobs and an iSpray nozzle used primarily for walls. 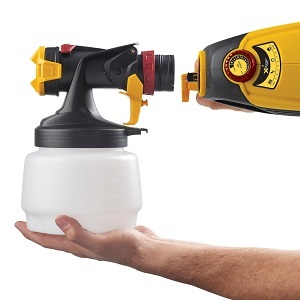 The power unit is handheld and compact and attaches directly to the sprayer nozzle without any additional hoses. From the tip of the nozzle to the end of the power unit, the assembly measures 12 to 14 inches long depending on which nozzle is attached. This means that any job that intended for the 3000 must be easily accessible without any confined spaces. Painting in between shelves or inside of cabinets may pose some problems. The 3000 is a very quiet system. The system only runs when the trigger is pulled. Detail Sprayer: The material for all jobs that I will use the 3000 on will be either water based or water borne paint. On 5 jobs, I was shooting primer. I shot a heavy solids primer similar to Zinseer or Kilz, followed by Behr 75. In all of the jobs, I used the detail sprayer and adjusted the material flow. I left the power unit setting at min. The unit did an excellent job at laying the primer down. There was no problem shooting the heavy solids primer but, I did cut it. One thing I did notice was that the unit was heavy and caused my arm to tire after a while. On the next series of jobs using the detail sprayer I sprayed a satin enamel. The 3000 laid down an excellent finish on each of the jobs. One thing I noticed compared to my other system was that the finish laid down by the 3000 is much less susceptible to flashing. This makes it a good tool to use on doors and trim. I was impressed. Pattern width control is not part of the detail nozzle design and would certainly be a plus if added. Clean up of the sprayer really doesn’t take more that a few minutes. I don’t usually spend more than 5 minutes, but I have had a lot of practice. PROs: Excellent finish, quick to assemble, easy to clean CONs: Heavy, work must be easily accessible iSPRAY: I did several jobs using the iSpray nozzle. I am familiar with this nozzle as I have done many jobs with an earlier revision of it on the 890 system. One of the changes that was implemented on this revision of the iSpray was the material flow control. It has 12 numbered positions which make dialing in the proper flow easy. Some additional changes were made on the nozzle itself which I assume were aimed to eliminate the stippled finish of the earlier version of the iSpray. I wasn’t able to confirm this since I was painting textured walls. 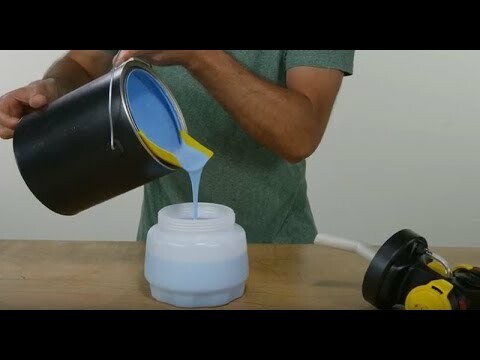 For my jobs, I was shooting both PVA and latex wall paint. I had used both of these paints before on my other system. I prepared the paints by filtering and cutting. I started with a small amount, 500 ml. I left the power unit on min as a start and dialed in the material flow from 1 to 4. Although there wasn’t much paint in the sprayer, the unit became heavy after a short use. It would be very tiring using this while working on a ladder especially with a full sprayer. My paint strokes with the iSpray did not start smoothly. Each time I pulled the trigger, the nozzle would spit. Normally, I would expect spit if the paint wasn’t cut properly. That wasn’t the issue here. I attempted to eliminate the problem by adding power. I tweeked the power setting from min up to 3. That did not fix the spitting problem. All it did was cause the unit to consume more paint. Paint consumption has been an ongoing battle between me and the iSpray. At power = 3 and material flow = 4, the 500ml I had loaded in the sprayer didn’t last long. I encountered an additional problem with the iSpray that did not manifest with the detail nozzle. This was a delay in material delivery between trigger pulls. With the detail nozzle, the type of work being done generally involves quick strokes in rapid succession. With the iSpray, the strokes are slower and the time between release of trigger to pull of trigger is usually a few seconds longer compared to the detail sprayer. With each new pull, there was a noticeable delay between the time I pulled the trigger until the time the paint started spraying. It was only a second or 2 but I had already started the stroke. Clean up was similar to what I am used to. The entire process took only about 5 minutes. PROs: material flow much easier to adjust on this revision, clean up is easy CONs: Heavy, spits, excessive paint consumption, flow delay Overall: I like this system with the detail sprayer. It is very quick to set up and lays down an excellent finish. Clean up takes just a few minutes. I highly recommend the system for jobs compatible with the detail sprayer. I do not like the system with the iSpray and don’t recommend it at this time. Rated 4 out of 5 by Chad49 from Good Sprayer! Used this sprayer to paint my garage door.After unboxing and reading instructions I found the sprayer to be easy to operate.Did have to clean the tip often and cleanup took some time but I was prepared for both so I wasn’t surprised.Overall it got the job done and I was satisfied with results.I wouldn’t try to spray cabinets with this sprayer but would use it on anything else. Would recommend this sprayer! Rated 4 out of 5 by Melanie from Easy to use! I used this product to spray a dining room table that I was refinishing for my dad. The table had some water damage and because it wasnt real wood, I had to take putty and wood filler across the entire top of the table. Once sanded and cured, it was time to paint! The was extremely easy to load and use with nice even strokes. I had to get into the groove of the strokes so it spread evenly and tilting in different directions only caused the paint to run a little after a while but nothing to take away from its usage. I would say it was more of a gravity thing. Project turned out well and it was fast and easy! Rated 5 out of 5 by Fracker from Great quality sprayer The Flexio 3000 will be my go-to sprayer combo from now on. It worked really well on my wooden fence. Made the job so much easier than before. I could easily adjust the settings to optimize coverage for the latex stain I used. The Flexio 3000 comes with two sprayers, one for small, detailed projects, the other for large jobs, like my fence. Cleanup was simple; now I'll be ready and eager for my next paint job. A nice carry case protects both sprayers. Painting can be fun! Rated 5 out of 5 by MattSch from Wonderful Sprayer Great Flexibility and Features I received this product about a month ago and just recently purchased a new home. Wow did this sprayer help to get rooms painted quickly and efficiently. The different power settings made it easy to get the power just right for the paint that I was using. Cleaning was a snap too. I was finished painting and had everything cleaned up in no time. I highly recommend this sprayer! Rated 5 out of 5 by JoM1 from Love it. Received the Flexio 3000 to test and review. It was a little heavier than I thought it would be but still easy to handle. I painted a patio chair with Rustoleum in black and it looks great. It went very quickly, even with drying time between the two coats. Smooth and even finish and clean-up was no problem. I'm looking forward to a few more projects this spring. Can I paint ceilings with the Flexio3000? You can, but it should only tilt up, up to 45 degrees. With the Flexio 4000 you can tilt up, up to 60 degrees, making it easier to paint a ceiling. Looking to use the 3000 to apply Behr Alkyd Semi-Gloss to a primed cabinet door. &nbsp;Any recommendations? &nbsp;Disappointed in using the sprayer for the primer on the cabinet door so I'll probably have to lightly sand it before I can apply the actual paint now. The only paint company that states not to use their paint in HVLP sprayers is Behr. It's because it's so thick and would require too much thinning. You're right the finish will never be smoother than the last coat you applied. In other words, if it's not smooth enough, another coat won't fix that. It must be sanded. For help with selecting a different paint or paint sprayer call us at technical support at 1-800-328-8251. Can you spray zinser BIN primer with this? The water based version is fine, the shellac based version cannot be used in the Flexio. The Flexio 3000 comes with two front ends. The larger, iSpray, is intended for use with full thickness latex paints. It will provide a roller like texture. The smaller, Detail Finish front end, is used for thinned paint or finishes to achieve a furniture quality finish on your project. Thinning even just a little helps all thick materials spray better. For more tips on spraying, call us at 1-800-328-8251. Is there a separate nozzle that is needed for decks/floors ceilings. The Flexio 3000 comes with the new nozzle designed iSpray, the Detail Finish Nozzle. 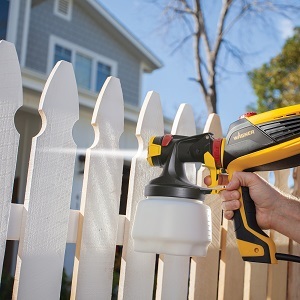 The iSpray Nozzle, which will spray unthinned coatings including latex paint and stains, is ideal for big surface projects such as spraying walls, sheds, fences, decks and ect.. As long as the sprayer is not tipped more than a 45 degree angle using the FLEXiO handheld Material could get into the turbine and performance can be decreased. If you need further asstiance, please give us a call at 1-800-328-8251 and we will able to assist you. 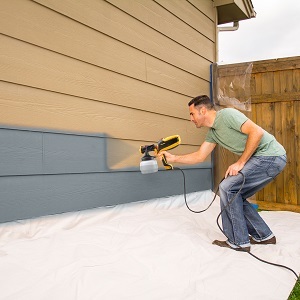 The Flexio series will spray one coat and sealer product from Valspar. Please give us a call at 1-800-328-8251 if you need further assistance. Can the Flexio handle enamels? 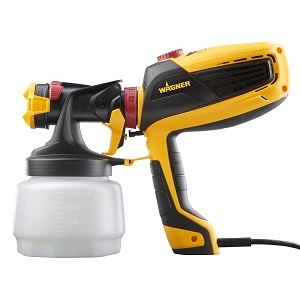 All Wagner sprayers can use water based and oil based paints, stains and finishes. You can spray just about anything with the Flexio 3000. Use the Detail finish nozzle with paint thinned 10% for a nice looking finish! Call for more spraying tips at 800-328-8251.